Welcome back, Cutting Edge Stencils fam! 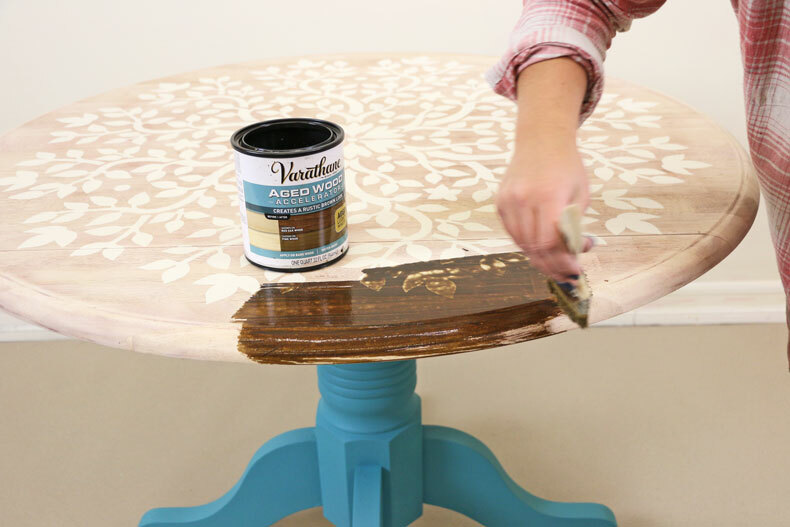 You all LOVED the final outcome of this stenciled wooden table so we decided to show you how to do it! 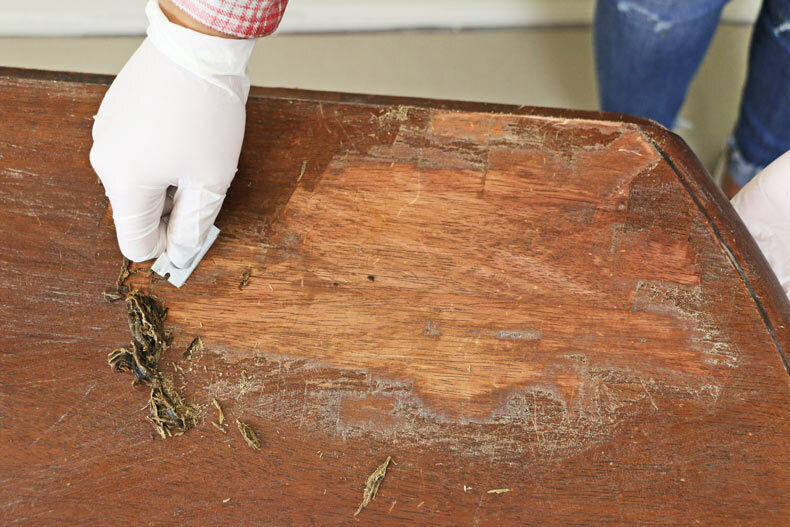 Think twice before throwing away your old wooden furniture! 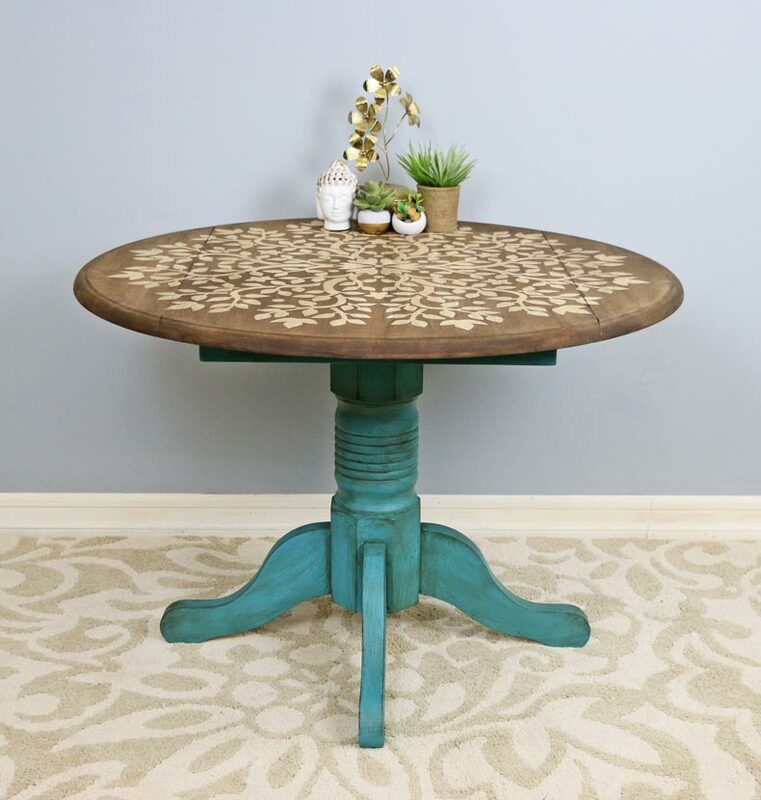 Using our antiquing techniques and trendy mandala stencils, you can create a brand new wooden table for your DIY home decor! 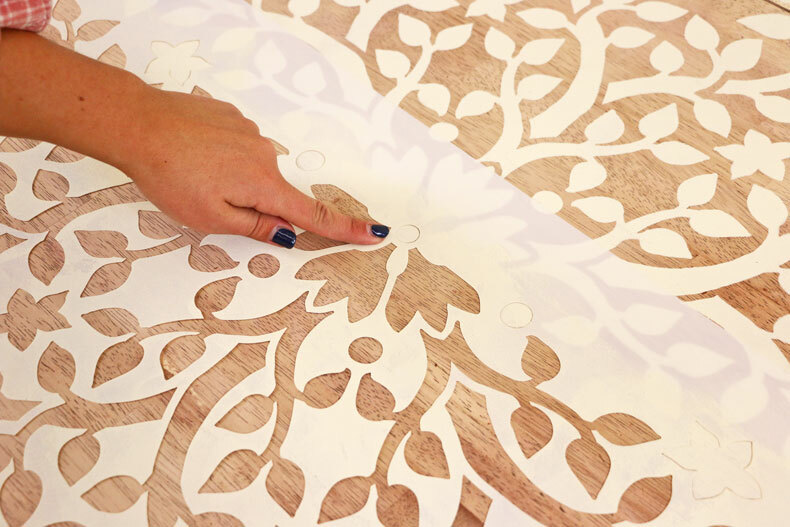 This step by step tutorial is super easy and you can choose from our large list of stencil designs to make it your own, but today is about our Tree of Life Mandala Stencil! 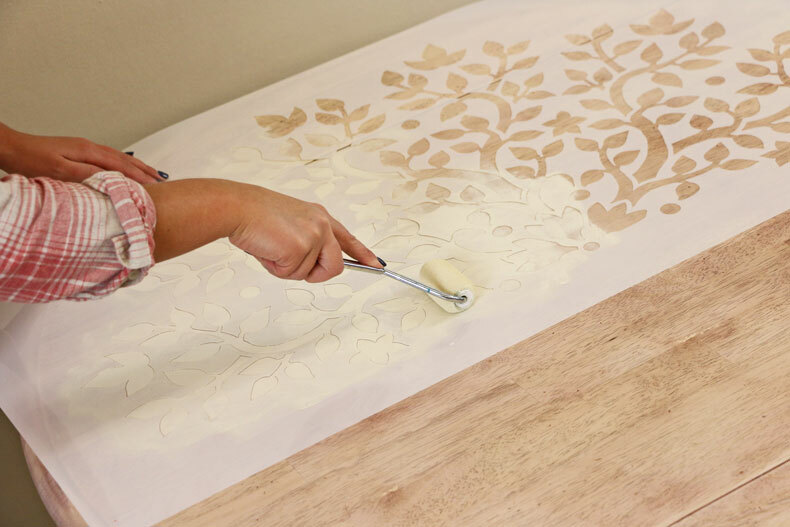 Check out this super quick video tutorial to see the whole stencil process in action and then follow along with the blog for step by step details! 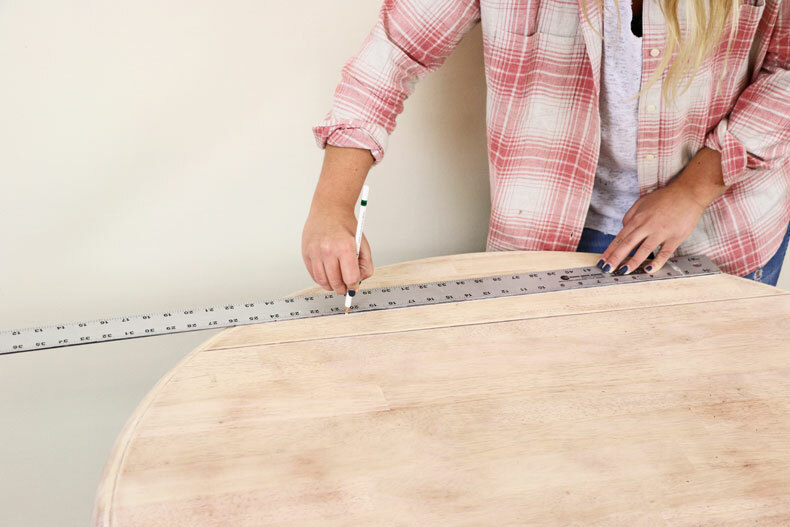 There are also refurbishing pro tips mentioned throughout the video that will take your upcycled DIY furniture to the next level! 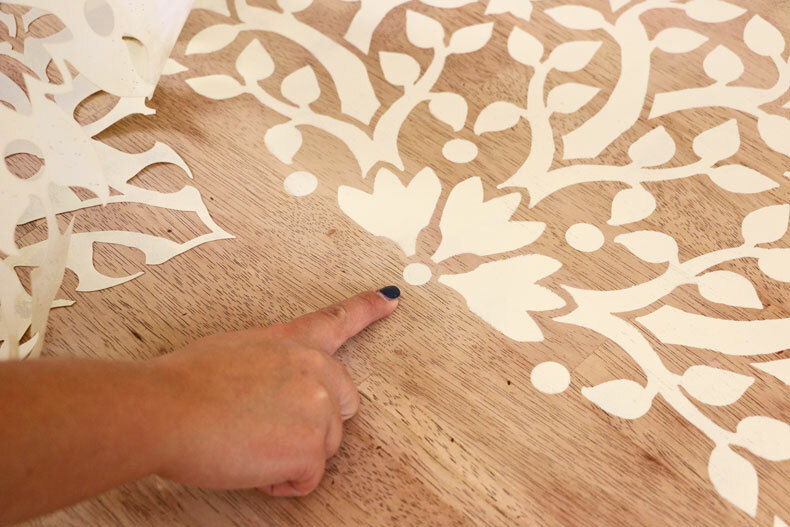 You can also check other videos on our Youtube page about decorating stencils for walls and other modern wall stencils! Let’s start with a before picture of our wooden table! This has been in storage for years and did not think we would get any use out of it! As you can see it looks pretty worn out with scratches and stains! 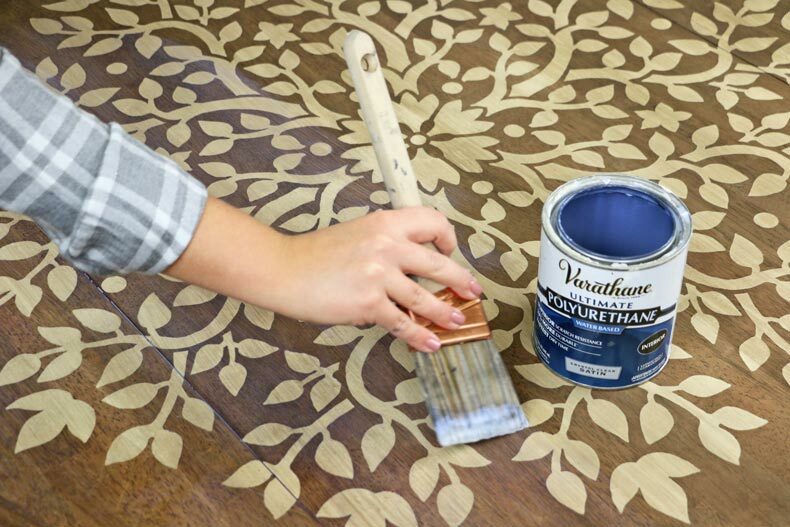 There are a few steps we have to take before stenciling on the natural wood top. 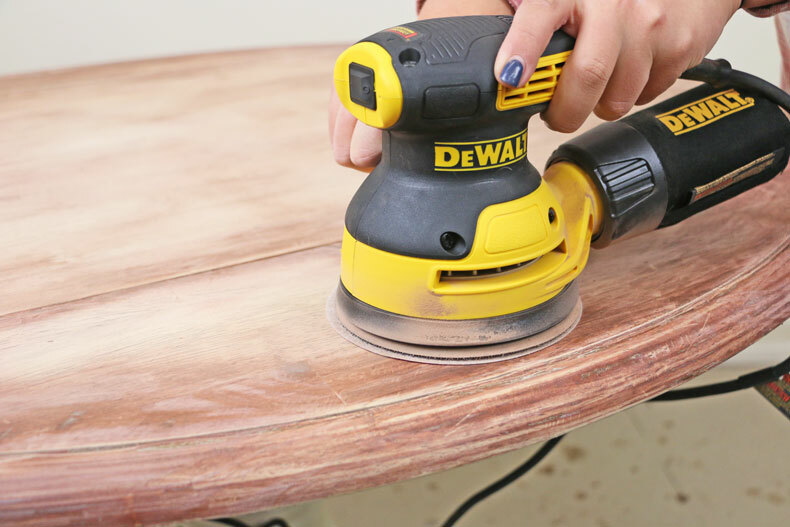 This would be stripping away the current clear coat thats on the table. Here we are using Klean Strip Premium stripper. But, any brand will work just fine and you can find them at any local hardware store. Follow the directions provided on the back and remember to ALWAYS wear gloves because it will burn your skin! 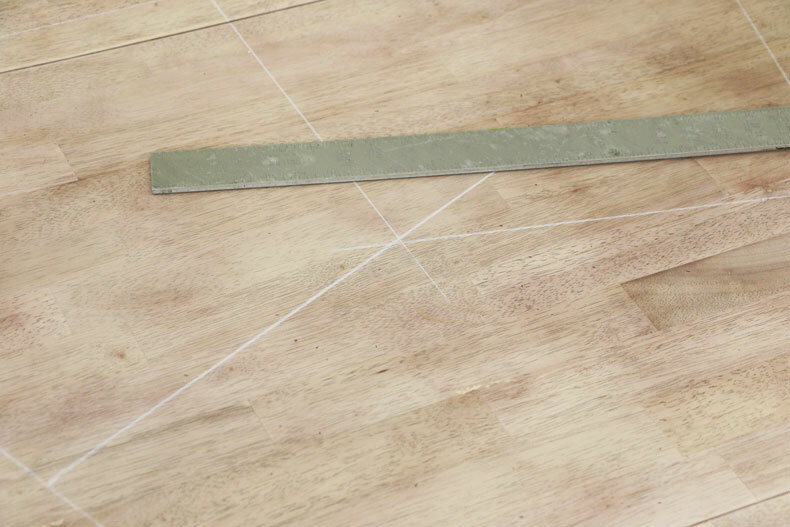 We are going to use a disposable chip brush and brush the stripper in the same direction as the wood grain. 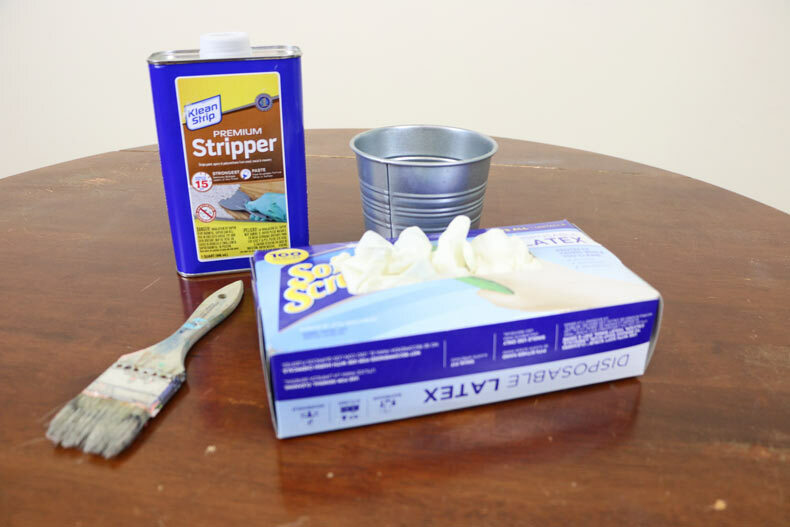 Load your brush with a lot of stripper to avoid doing this multiple times! After waiting 15 minutes like the directions said, we are going to scrape off the top layer. You can scrape it using any sharp object such as a small razor blade we have used below! Just be sure not to scrape the top of your wood! 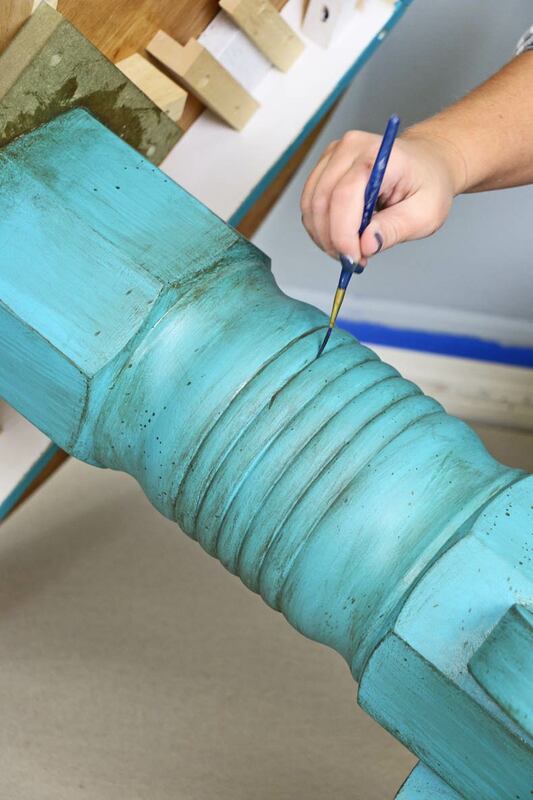 Next, we want to remove that brown stain that was sitting under the top coat. Using 120 to 220 grit sand paper, we will sand it off so we can stencil on the original wood. 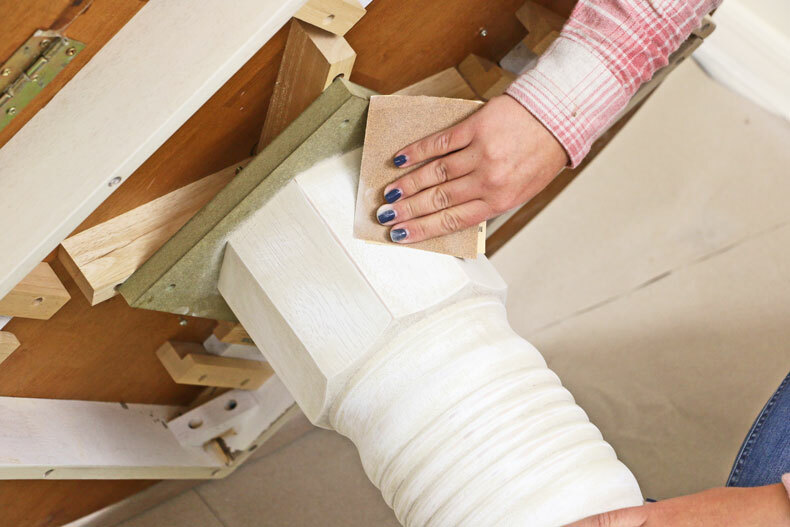 An important part of refurbishing your old wood is keeping the existing details. You don’t want to over-sand your profiles. 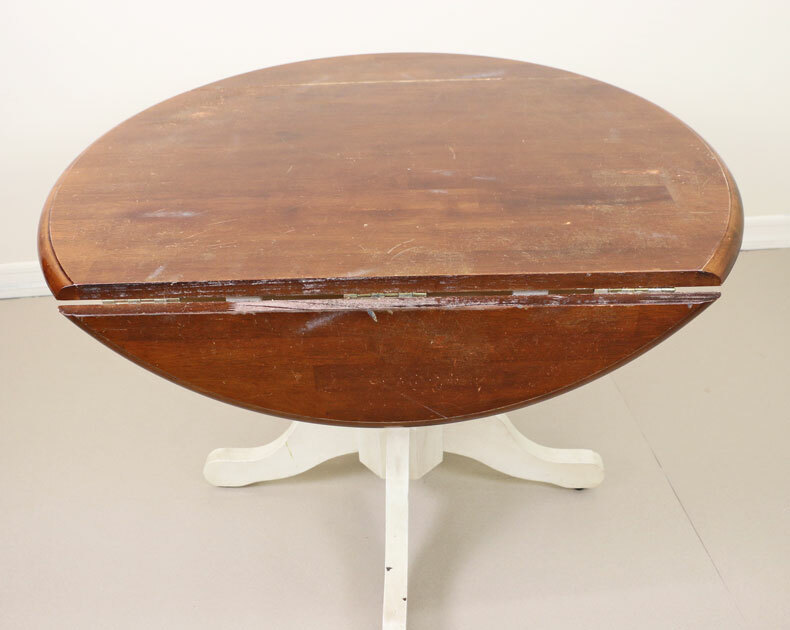 For example we made sure not to sand down the ogee on this table. Now, let’s prep the legs. We are going to create some adhesion by sanding the legs with 120 grit sand paper. Then, we are going to prime them using STIX Bonding Primer. 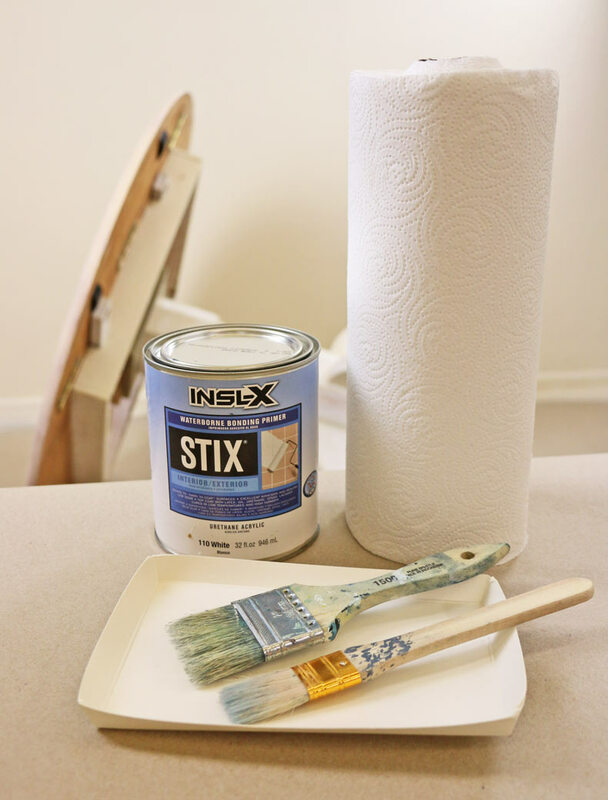 We find that STIX primer creates the best adhesion! 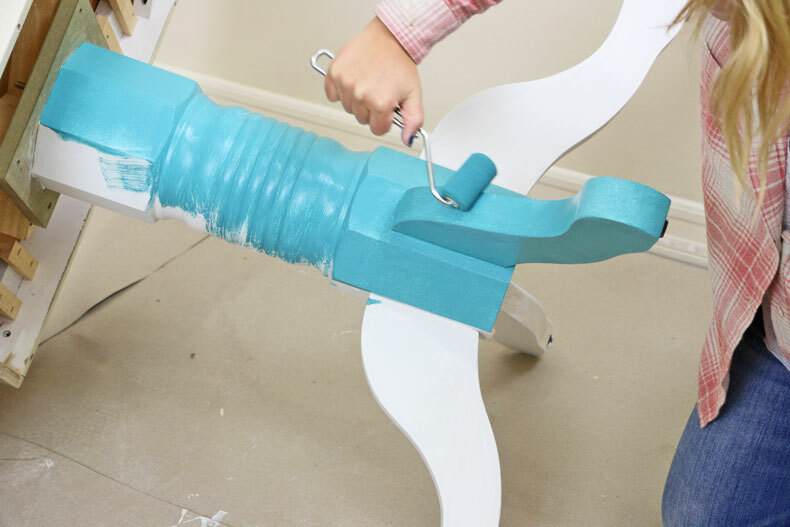 Then, we are going to paint the legs with a teal color! This specific color is Benjamin Moore’s #664 “Poseidon” in a semi-gloss finish. We want to paint in a semi-gloss finish because we will be antiquing this with a glazing medium. 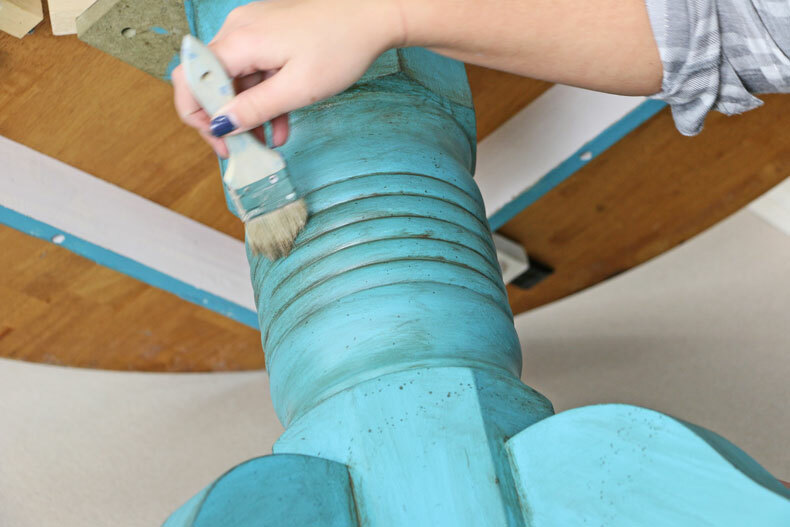 The reason behind choosing a semi-gloss finish for the legs, is because the flat paint does not take glaze well! 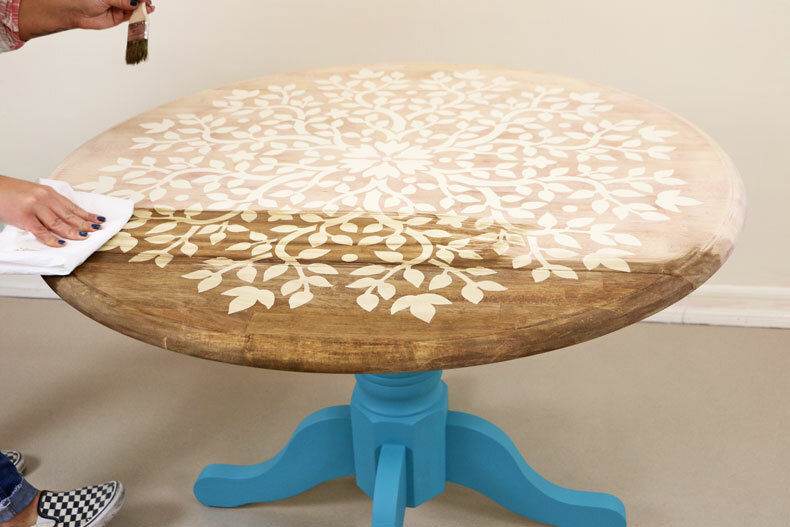 We want our mandala stencil directly in the center of the table. 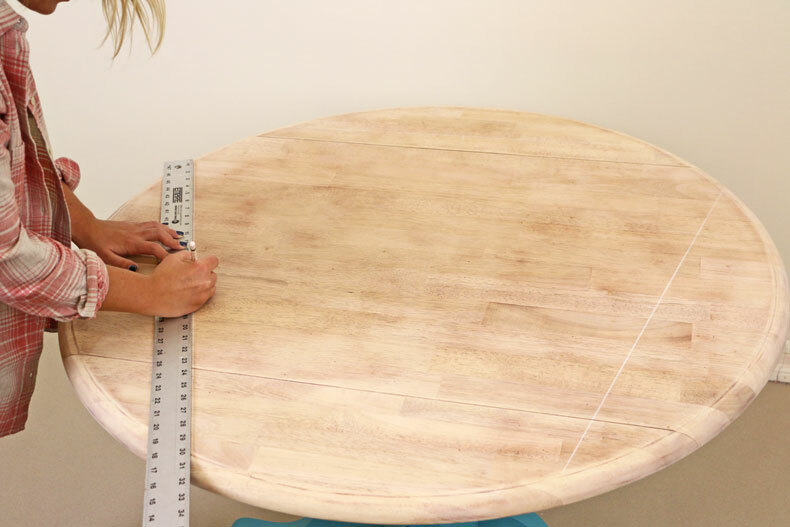 We are going to be drawing three chords on our circular table top using a chalk pencil! A chord is basically a drawing between two edges of a circle. We chose chord lengths that are easy to divide in half. So our first chord is going to be 26 inches. Then you will put a mark at 13 inches (which is half). And then we continue to repeat the process but drawing two more! We are going to take our square and draw 90 degree angles from each of the three midpoints. 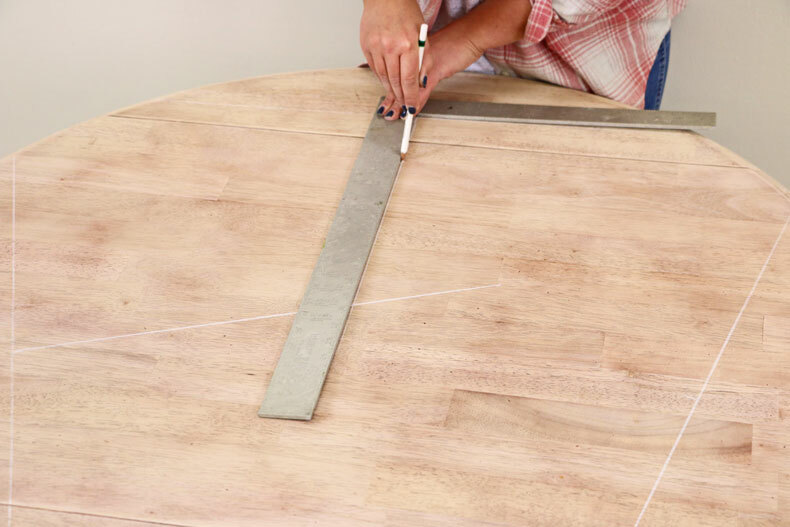 When the lines start to cross each other, you will see the center of your table! 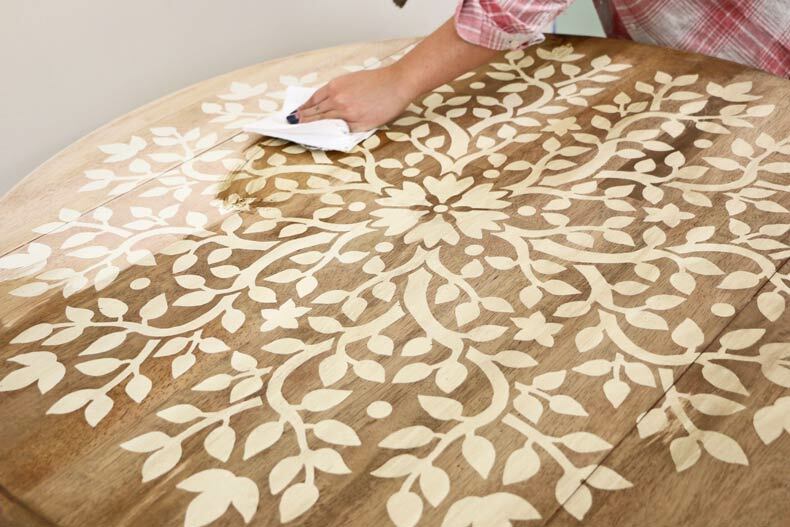 A key factor to reduce bleed when painting over your mandala stencil is loading your roller the correct way. 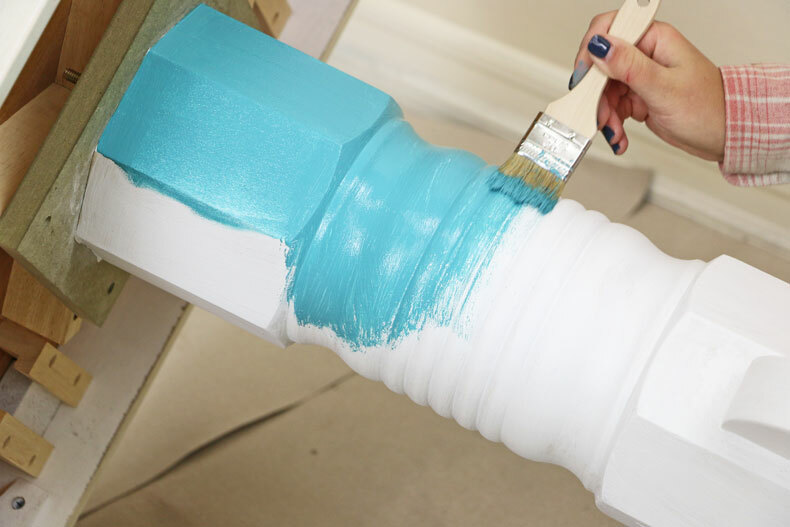 You want to evenly load your dense foam roller with paint and then offload the excess on a papertowel. Stenciling on wood is tough because if might not stick right away. But remember to roll gently or you will get bleed! 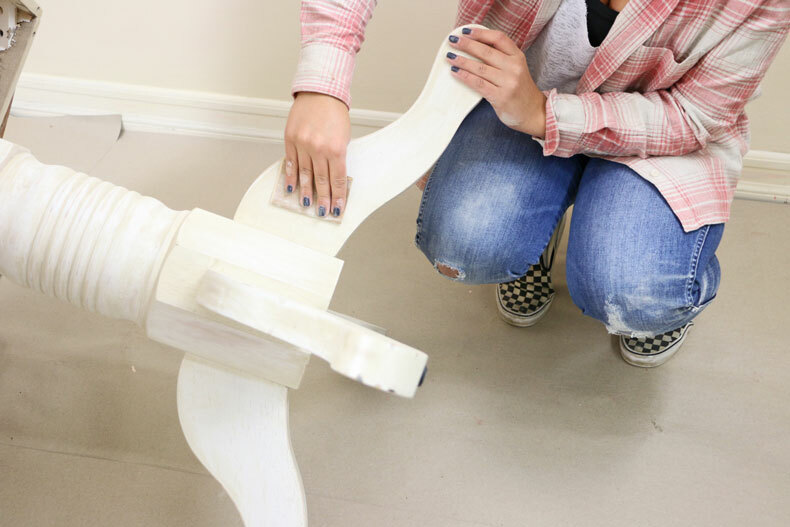 take your time and remember how amazing your furniture will look once its complete! 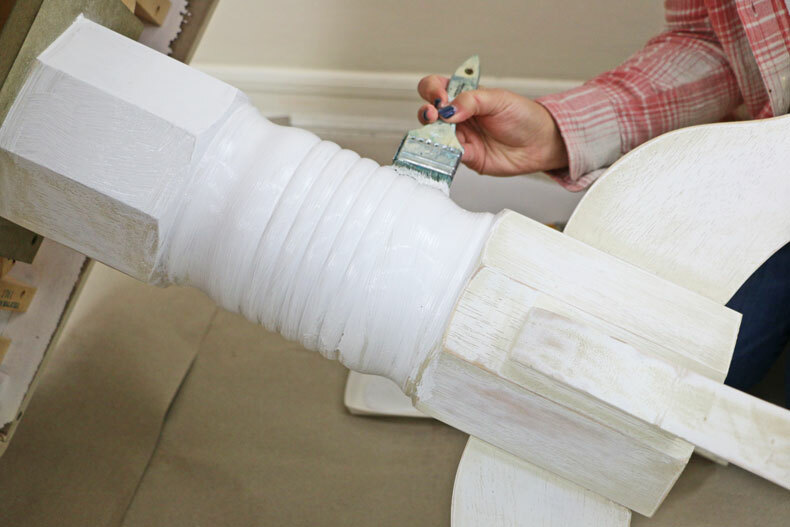 Because wood is very porous, take a professional stencil brush and pounce the areas the roller could not reach. When it is completely dry after a few minutes, you can do the next side. 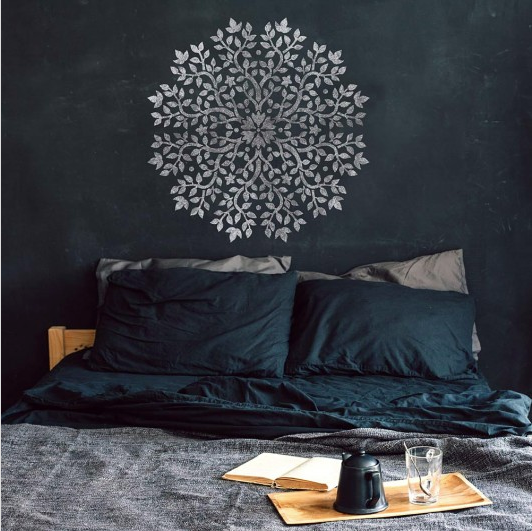 Easily align your Tree of Life Mandala stencil with the previously painted area and REPEAT! 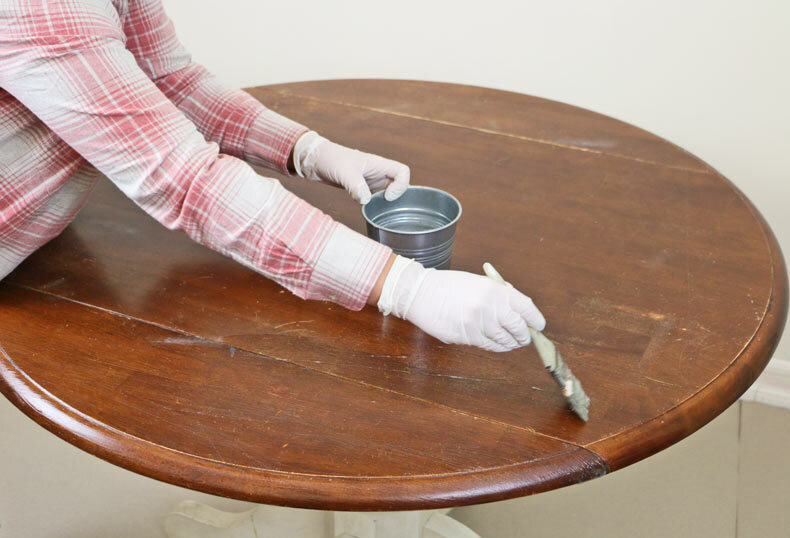 You can choose to leave it as it is but we feel a fresh new stain will bring the table together! 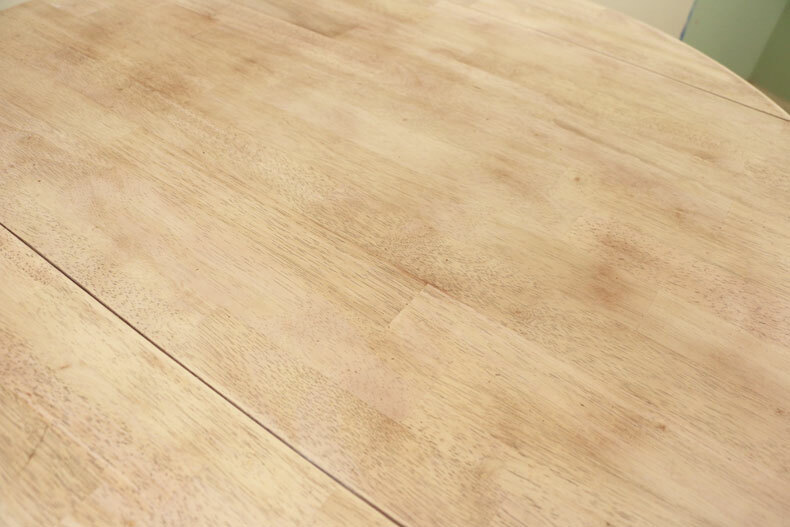 For this table, we used brown water based wood stain. We recommend water based because it adheres to the wood a lot better AND the clean up is much easier! Now it’s time to antique your legs! You can use brown glaze or make your own. Making your own is super easy. You mix one part Raw Umber acrylic paint and three parts clear glazing medium! 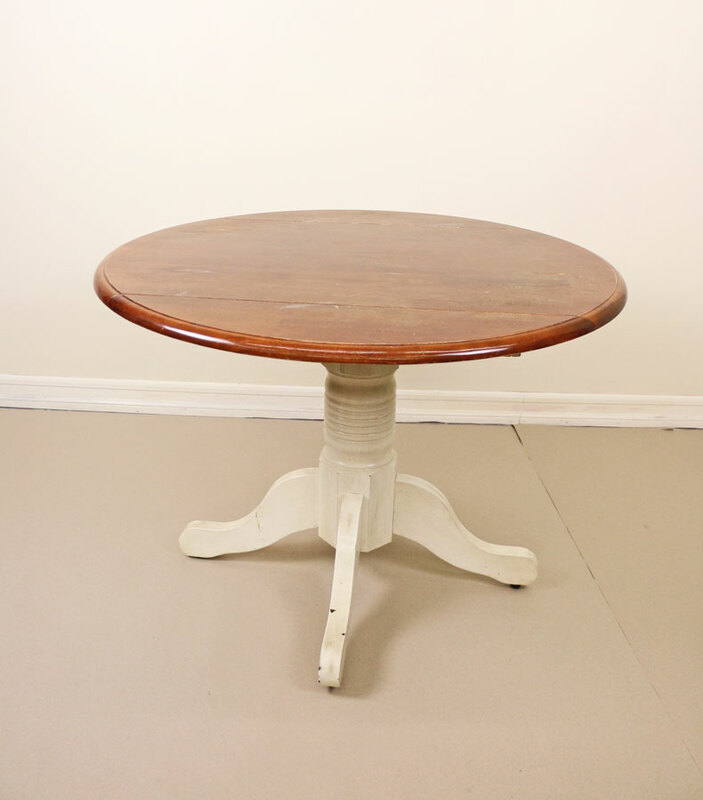 Raw Umber is the perfect color for antiquing and the medium will give it the translucency it needs! Be sure to get the glaze in ALL corners and edges. Our final step is clear coating the table top! We always recommend using a water based polyurethane with a satin finish. 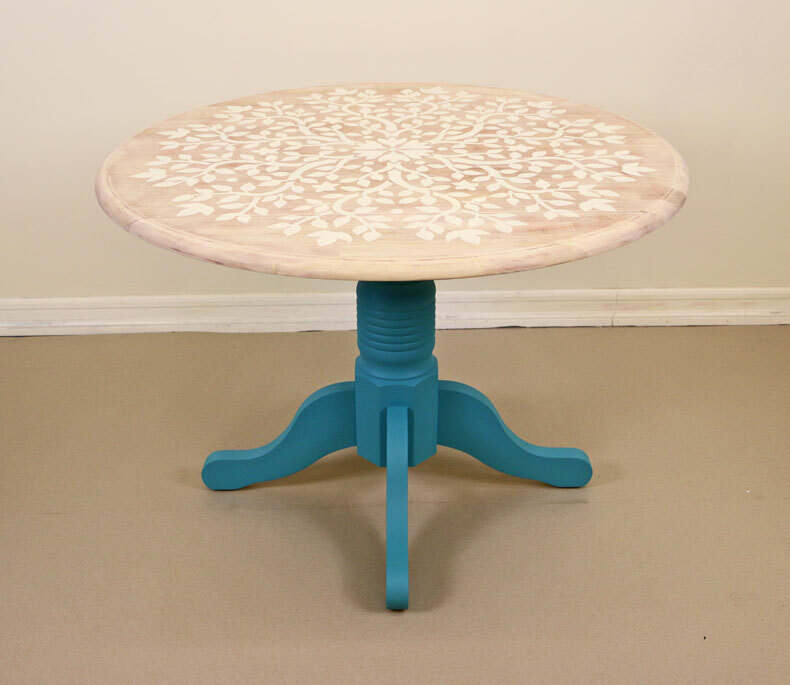 Clear coating will protect your table from spills and other minor damages that may hurt your stencil design! 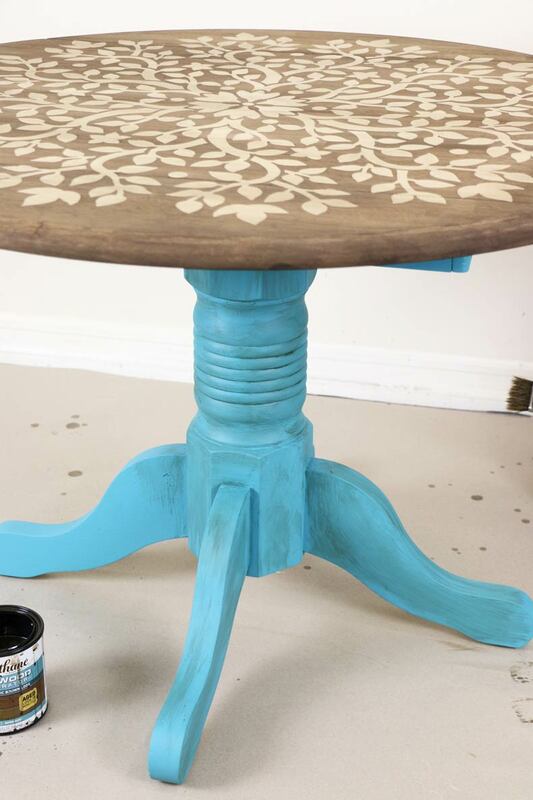 Stenciling ALL types of furniture is SUPER easy! Check out our website too see other stencil designs. 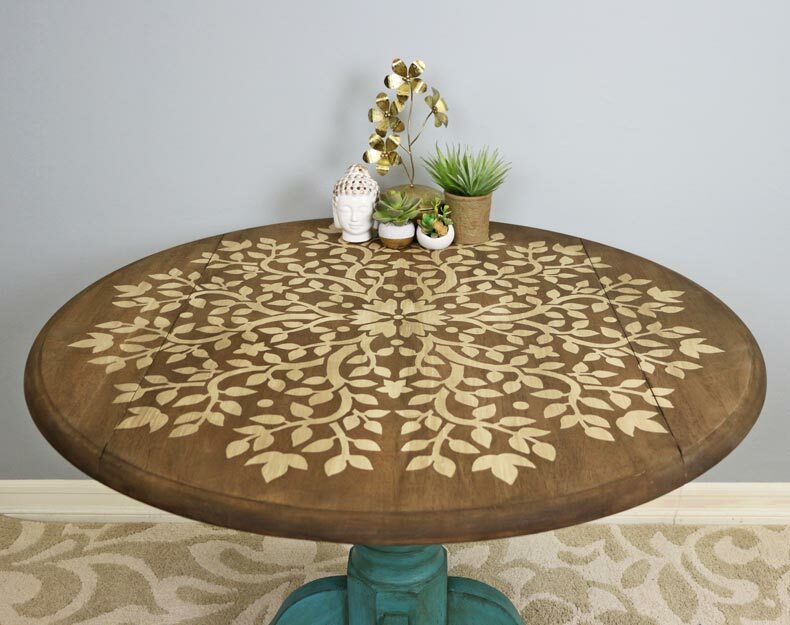 Who knows, you might even stumble across the perfect stencil design for you furniture stencil that can help you transform your space!